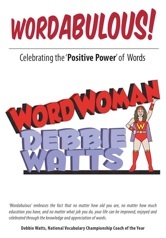 WORDABULOUS, Tenn. (2014) – National Vocabulary Coach of the Year, musician, speaker and educator Debbie Watts has penned a new book to show individuals how life can be improved, enjoyed and celebrated through the knowledge and appreciation of words. Wordabulous! 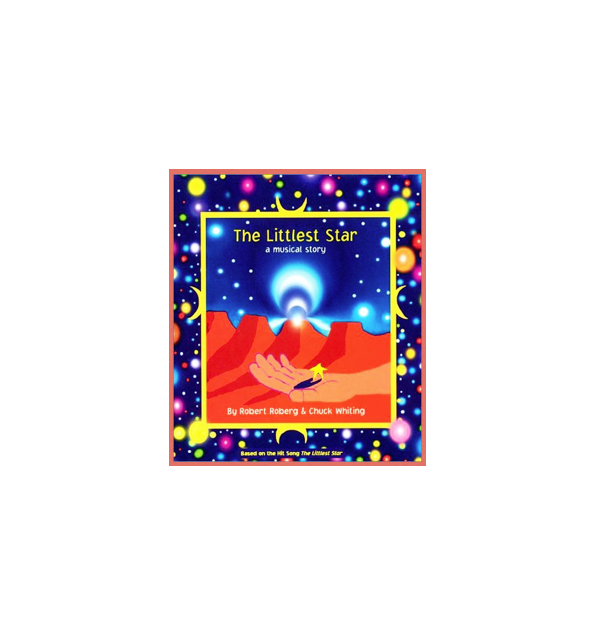 -- Celebrating the 'Positive Power' of Words is available through selected retailers, Amazon.com and Shine Time Books. Described as a fun-filled guide to a better vocabulary, the book provides the author's insights on words, some "words of wisdom", and chapters arranged in a "word-a-week" configuration. Watts learned about the positive impact of words during career stints as an award-winning game show producer for TNN: The Nashville Network, a musical performer for the Loews Vanderbilt Plaza Hotel, and a middle school teacher (now literacy coach) for Sumner County (Tenn.) Schools. "The examples I have chosen to use in the book are strictly my own preference," said Watts, who was inspired to write Wordabulous! after being named the country's top vocabulary coach by the Game Show Network. "There is a larger world of words out there, and readers are encouraged to develop a vocabulary that will help make their own lives more successful, enjoyable, and in short, 'wordabulous'." Readers can improve their word usage by studying famous quotes by legendary writers such as William Shakespeare and Emily Dickinson, new words that are helping shape the 21st Century, the latest text messaging lingo, commonly misspelled words, misused words, and clever quizzes to test one's understanding of words. Watts is well prepared to take her message into the vocabulary stratosphere. For more than five years, she has inspired teenagers as an award-winning middle school teacher at Merrol Hyde Magnet School in Hendersonville. Before that, she was a highly respected writer and producer of game shows for Reid-Land Productions and an acclaimed performer at Opryland theme park. Also a singer-songwriter-pianist, she regularly pitches songs to publishers on Nashville’s Music Row and performs on Wednesday evenings at the Loews Vanderbilt. Today, she is known as “Word Woman,” a “guru” of grammar, a “high priestess” of pronouns and prepositions, a “comma-mama”, and among other things, a “woman of words”. Her creative antics for student motivation were recognized in 2008 when she was named National Vocabulary Coach of the Year. She won a cash prize of $1,000, another $1,000 in books for her school, and an invitation to attend the nationally televised competition in Santa Monica, Calif. The honor landed her news media exposure across Middle Tennessee. She says it was one of the happiest moments in her life and a turning point in her career. In late 2008, "Word Woman" got to work on her book, developing chapters containing famous quotes, new words for the 21st Century, commonly misspelled words, and professional "buzz words". She even surveyed her students to develop a special chapter on "teenspeak and message lingo". For the "BYOW (Bring Your Own Words)" chapter, she created her own list of new words, including "flibbertigiblets", "rock 'n' rollover", "X-it" and "Zagnut". ‘WORD WOMAN’ TO THE RESCUE! Watts, who sidelines as a vocabulary consultant and staff development speaker for Tennessee public schools, plans to launch a national speaking tour after her new book is released. She hasn’t been shy about pursuing every music, broadcast or “wordabulous” opportunity she hears about as the book’s release date nears. She currently has a script in development for a full-length feature film on the life of Leonardo Da Vinci. The budding author already has inspired fellow teachers with the book, Eat My Chalk Dust: Creative Teaching With a Sense of Humor. Her first book, Diary of a Nashville Lady: Recollection & Recipes, is based on a historical/fictional character she created named Elise Bransford. Also on the “writing board” are two heartfelt stories for children. A number of respected Middle Tennessee professionals have already endorsed Wordabulous!. "Words are the paint we use to create the pictures of our lives," said Lori Kissinger, executive director of VSA Arts Tennessee and a member of the Department of Speech and Theatre for Middle Tennessee State University. "The larger our vocabulary, the more vibrant our tapestry. The concept of 'wordabulous' is a terrific idea." "Never have we laughed so hard over a discussion of words," said Barbara Nowak, co-host of Sauced!, a nationally syndicated radio talk show. "Words, of course, are serious business. But Debbie has made their usage in everyday situations something to smile about… and to remember." "Debbie Watts offers a delightful compendium of words, meanings and joyous play with the English language," said Candy Paull, author of The Art of Abundance, The Art of Encouragement, and The Art of Simplicity. "Whether you want to inspire students to love vocabulary or just want to savor the flavor of both new and familiar words, you’ll find tons of word fun in this book." Wordabulous! retails for $9.95. 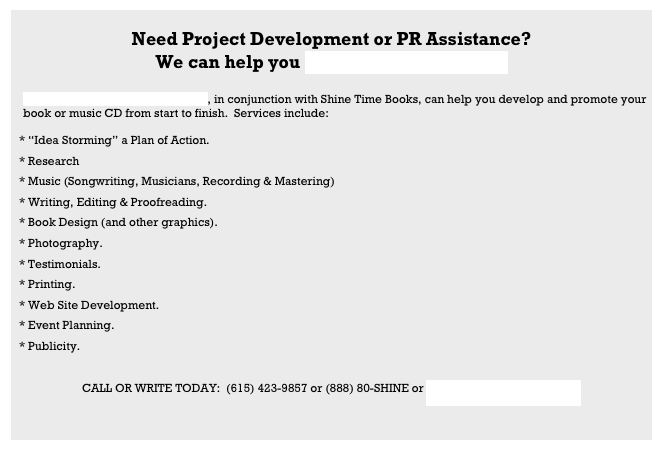 For more information or to order the book, call (615) 242-9857 or (888) 80-SHINE or send an e-mail to info@shinetimebooks.com or info@Wordabulous.com. 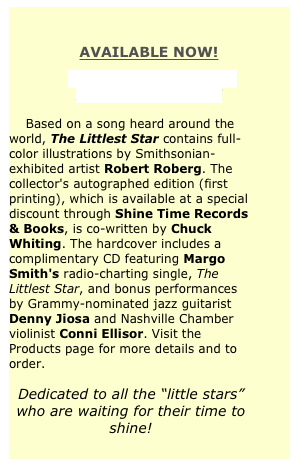 It also can be ordered directly through this site or at Amazon.com (search word: "Wordabulous"). Visit “Word Woman’s” blog at http://www.debbiewatts.net . When I first met award-winning artist/author/educator Debbie Watts, I was amazed by her heart-felt enthusiasm and wealth of ideas. In just a few short months, she developed her 'Word Woman' persona to creatively coach high school students for the National Vocabulary Championship. When the Game Show Network named her the National Vocabulary Championship Coach of the Year, Ms. Watts knew she had discovered her true calling -- to help people improve their lives by using the right words. With her third book, 'Wordabulous! ', 'Word Woman' takes readers on a power word mission for success. This wonderfully inspiring book is sure to test your knowledge, tickle your wordy-bones, and inspire you to greatness. I'm very proud to be working with America's lady of words, and also eager to see how her latest 'Word Woman' adventure unfolds in classrooms, business offices and households around the world. Debbie Watts offers a delightful compendium of words, meanings, and joyous play with the English language. Whether you want to inspire students to love vocabulary or just want to savor the flavor of both new and familiar words, you’ll find tons of word fun in this book. Kudos to Mrs. Watts for creating a fun and engaging character to help her students experience the power and wonder of words. -- Carla Cushman, Teacher Center Supervisor, Sumner County Schools in Gallatin, Tenn. The power of words makes us human and should be a lifelong journey. 'Wordabulous!' is not to be read with the idea of 'finishing', but rather continuing the journey. . . and what a rich and rewarding one it will be. 'Word Woman' and her concept 'Wordabulous!' takes all. Words are the paint we use to create the pictures of our lives. The larger our vocabulary, the more vibrant our tapestry. The concept of 'Wordabulous!' is a terrific idea. The Saucy Sisters wholeheartedly recommend 'Wordabulous!' We love words. Always have. And we’re usually pretty good at stringing a bunch of them together. But never have we laughed so hard over a discussion of words. Words, of course, are serious business. But Debbie has made their usage in everyday situations something to smile about… and to remember. She covers little words and big words. And even four-letter words (although some of those you’ll have to guess at because she left out certain letters for the sake of propriety). Our one disappointment was her chapter on BYOW. We were all set to get out the Riedel stemware until we realized she wasn’t talking about wine. Our vinous habits aside, we wholeheartedly recommend 'Wordabulous!'... and you can quote us on this: If you want to get farther in life and in your career, you’ll 'knead' this book. It will have 'duel' benefits: You’ll learn 'alot' and your language will illicit very much 'prays'. So go 'by' it! Increasing vocabulary is like gathering tools. The more tools you collect, the better. 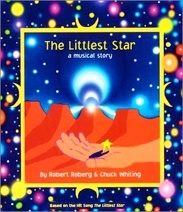 “The Littlest Star: a musical story” is the ideal gift for children of all ages!